Collaborator stores the contents of files under review on the server. Over time, this cache will grow to be quite large, and will periodically need to be purged. 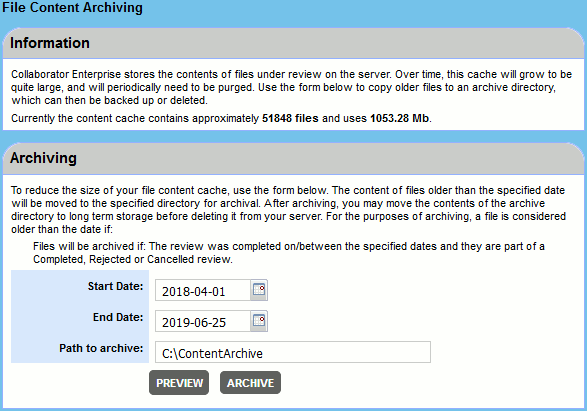 The Archive section of the administrator interface allows you to check the current status of the content cache and to archive (or delete) files that have not been in use for a long time. On the Information panel, you can see the estimates of the total number of files and their collective size. Keep in mind that these are approximate estimates, since a complete scan of content cache folder could take plenty of time. To determine a precise size of content cache and the total number of files in it, use standard file system tools. Files that belong to reviews that are currently in progress – that is, in Planning, Annotating, Inspecting, or Rework phases – will not be deleted. If a file belongs both to in progress and closed reviews, it will be copied to created archive, but not moved from content storage. Specify the desired date period using the Start Date and End Date fields. Specify where to store the archive in the Path to archive field. Click Preview to learn how many files and how much data will be moved by archiving. Click Archive to create the content cache archive. Tip: Archiving can take a lot of time (depending on the amount of files), so we recommend that you use this feature at night or during another time when Collaborator database is idle. Once the files are archived, they can be preserved in long-term storage or deleted entirely. On attempts to open any of the archived file, users would see the "Content for is not available – it was probably archived by your administrator." message. To restore files after they have been archived, simply copy them back into the live directory. Note: The directory structure must be preserved. The copy operation can be done while the server is running. Users will not be disrupted.